Because I know how much you love chocolate and because my husband had a very specific request, I made this cake to satisfy everyone’s chocolate craving. Ever since I made this supreme chocolate cake with chocolate mousse filling, my husband, who is addicted to chocolate, has been asking for a chocolate cake loaded with cherry pie filling. 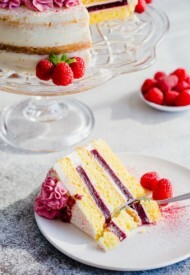 I try not to make too many rich cakes too often, but my hubby was so fixated on this cake idea that every night he would come home after work and check the fridge if I had made the cake for him. And I gave in and it disappeared in one day. We did share it with the family and everyone was happy. This cake is exceptional. Delicate white chocolate mousse balances not-so-sweet chocolate cake and cherry sauce adds bursting fruit flavor in every bite. The cake is actually pretty easy, nothing special that I need to address here. 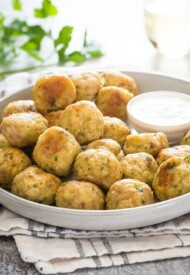 Just make sure not to over-mix the batter after adding the dry ingredients. Oh, if you don’t have instant espresso powder, you can substitute 1/3 cup of regular coffee. Adding a little bit of coffee, or espresso enhances the chocolate flavor. You won’t taste coffee at all. If you don’t want to add coffee, no problem, just add 1/3 cups of more milk. To make the white chocolate mousse, make sure you don’t boil the heavy cream. Otherwise, too hot cream can ruin the gelatin and burn the white chocolate. Want to learn more about gelatin? Check out David Lebovitz’s post about how to use gelatin. This cherry sauce is basically the cherry pie filling. You can use sweet or tart cherries here. If you’re using tart cherries, you might want to increase the sugar amount slightly. 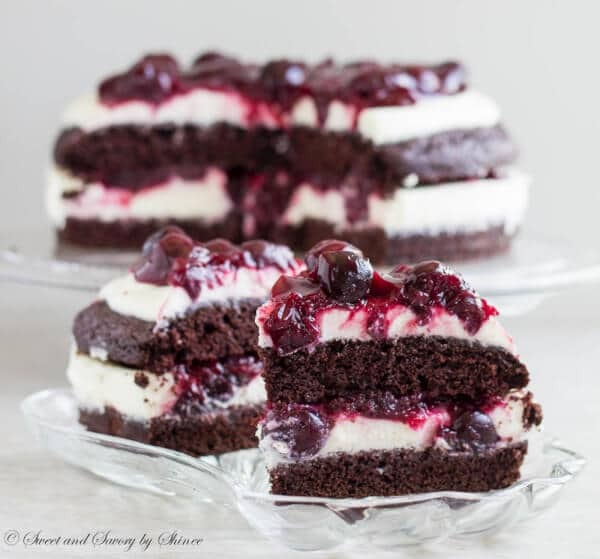 Rich chocolate cake filled with delicate white chocolate mousse and cherry sauce is ultimate chocolate heaven! 1. 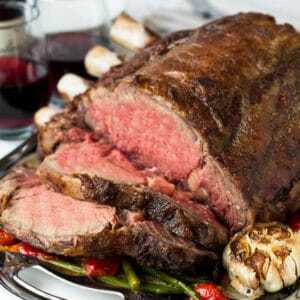 Preheat the oven to 350 degrees F (177 degrees C). Spray 9-inch springform pan with a cooking spray. 2. 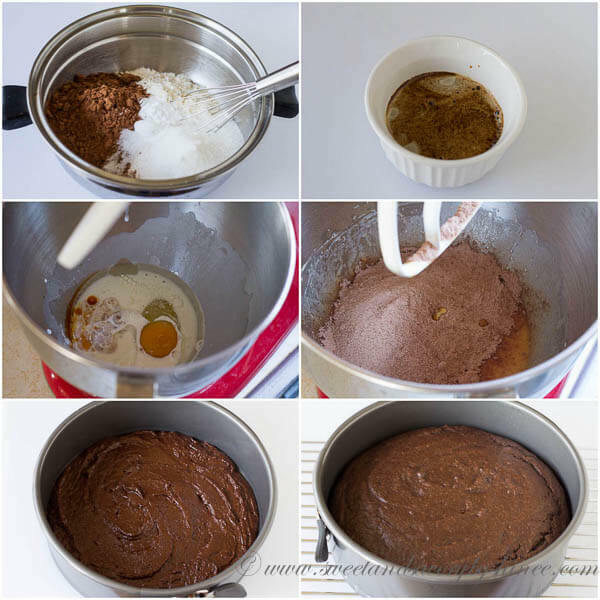 In a medium bowl, whisk together flour, sugar, cocoa powder, baking soda, baking powder and salt. Set aside. 3. In a small cup, dissolve the instant espresso powder in water. Set aside. 4. 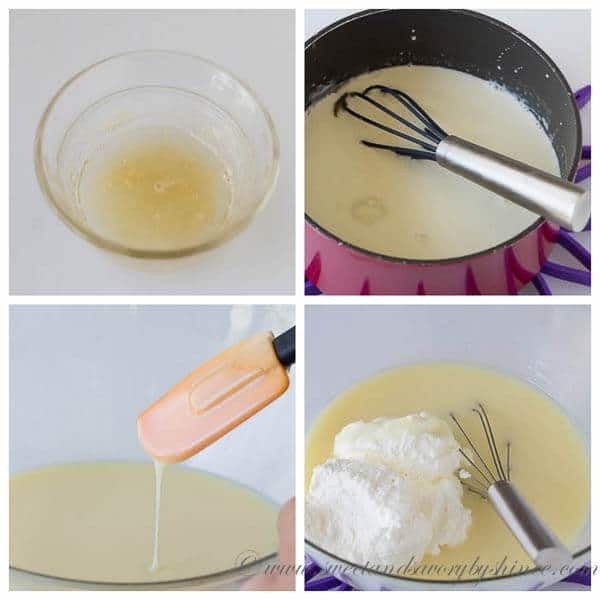 In a large mixing bowl with paddle attachment, mix together egg, milk, vegetable oil and vanilla extract on medium speed until well combined. Add dry ingredients and mix on low speed just until everything is incorporated. Stir in mixed espresso. 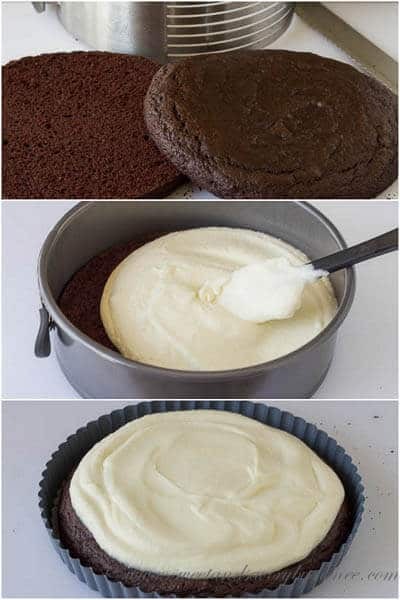 Pour the batter into the cake pan and bake for 20-25 minutes, or until the inserted toothpick comes out clean. 5. Cool the cake on wire rack for 15 minutes. Remove from pan and let it cool completely. 6. To make the white chocolate mousse filling, in a small cup sprinkle the gelatin over cold water. Let it stand for 5 minutes. 7. In a small saucepan, pour ½ cup of heavy cream and bring it to simmer over low heat. Don’t boil. Remove from heat and add the gelatin mixture. Stir until gelatin is fully dissolved. 8. In medium bowl, pour the warm mixture over white chocolate and using a silicone spatula mix until the chocolate is completely melted. 9. In a large mixing bowl with whisk attachment, whip the remaining 1 ½ cups of heavy cream until hard peaks. Fold in the whipped cream into the white chocolate mixture. 10. 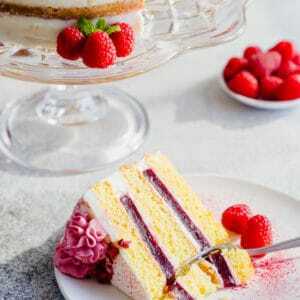 When the cake is cooled completely, divide the cake horizontally into two equal layers with a serrated knife. Put the bottom layer into the springform pan and add half of the white chocolate mousse filling. Spread evenly. Place the top layer on a separate plate and pour the remaining white chocolate mousse over it. 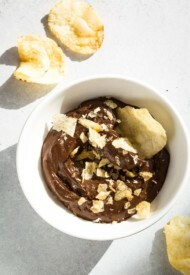 Place both layers in the freezer for an hour to let the mousse set. 11. Meanwhile, let’s make the cherry sauce. In a medium saucepan, bring the cherries to boil over medium-high heat. 12. In a small bowl, whisk together sugar, cornstarch and salt. Add this to the boiling cherries along with vanilla extract and lemon juice. Reduce the heat to medium-low and continue to cook the mixture, stirring constantly with a wooden spoon, for about 5 minutes, or until the sauce thickens. Remove from heat and cool completely. 13. 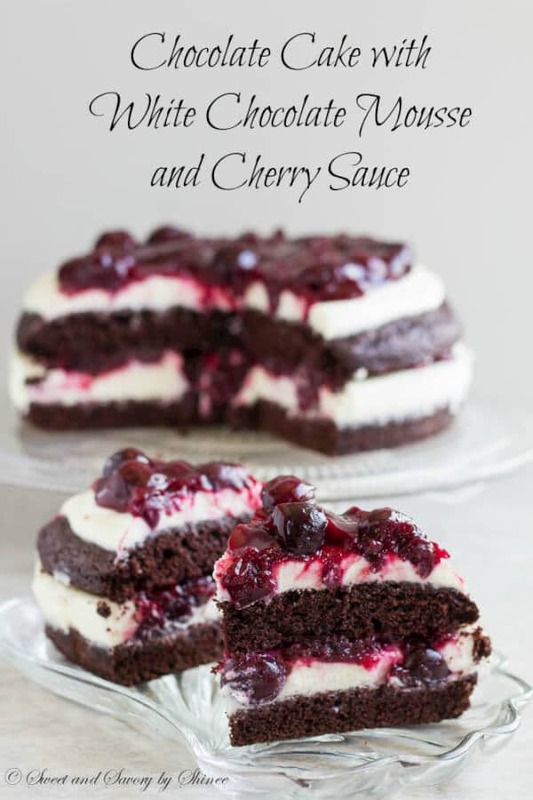 Pour half of the cherry sauce over the bottom layer with white chocolate mousse, then place the top layer of the cake with white chocolate mousse and pour the remaining cherry sauce. You may serve right away. Made this cake for Christmas with a slight modification due to necessity. It was SO delicious! Plan to make it for my birthday this year so that has to show how good I thought it was! P.S. 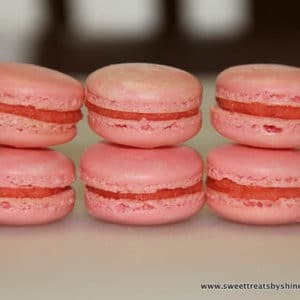 I wanted just a bit more of the cherry sauce but ran out of cherries so I added some cherry pie filling, mixing it well together, and the results were great. 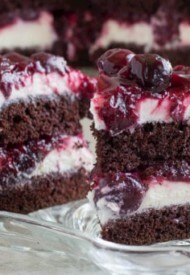 This year, I am putting extra cherries in the freezer so I won’t run out when I make the cake! Thank you for sharing the recipe! 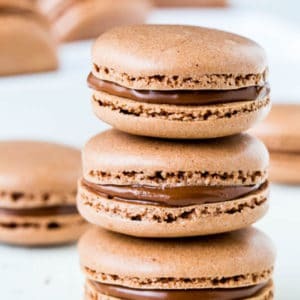 One little note: I have recently experienced and learned that baking powder sometimes forms little bitter balls in batter so make sure the baking powder in the cake gets broken up finely. I decided I might start sifting mine. Yay, so happy to hear you loved this cake. And thank you for your feedback and baking powder tip!! Hi, Shakinah! If you were planning to pipe the frosting, it may not hold its shape. 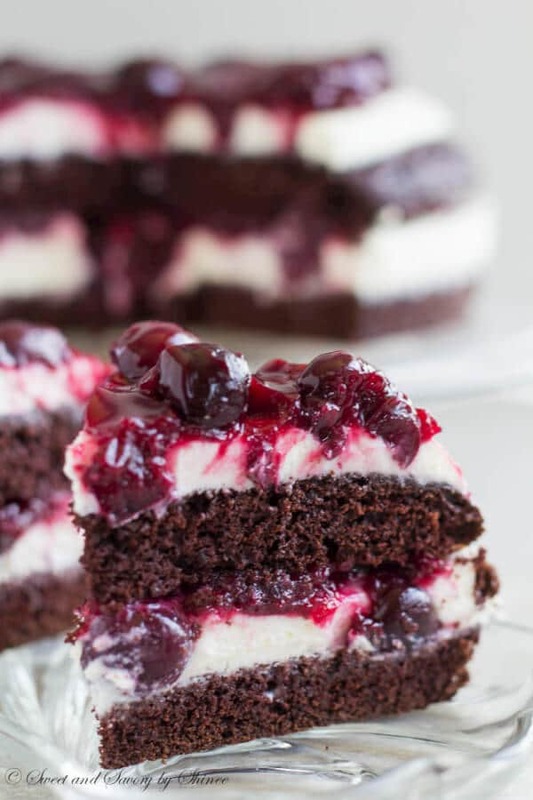 Just wondering if I could use 3 layers and alternate the fillings 2 chocolate mousse and one white mouse with the cherries and ice the cake with chocolate frosting. Do you think that would be too sweet? I can hardly wait to make this for my daughter in laws birthday. It looks so delicious. Hey, Patti! I don’t see why you couldn’t. It depends on what kind of chocolate mousse you’ll be using. But I don’t think it’ll turn out sweeter than this one is. Give it a try. And let me know how it turned out. Have fun! My youngest wanted a birthday cake that was like a chocolate covered cherry. Thanks so much for this recipe! We all loved it! I have a couple of tweaks. Instead of freezing the cake layers separately, I put the cake together completely in the springform pan, just leaving off the final layer of cherry sauce. I refrigerated it for a couple of hours, and it was perfect. My cherry sauce was more like preserves; next time I won’t cook it the entire 5 minutes. Also, next time I won’t bake the cake until the toothpick is completely clean; I thought it made my cake a little dry. I think I will treat it more like a brownie and let the toothpick be almost clean and see how that works. Husband thought it was the best cake I’ve made. It was definitely the prettiest I’ve ever made. Youngest was thrilled, and everyone really enjoyed it. I know what I’ll be making for the next book club meeting! Oh my goodness, Rich chocolate cake looks delicious! I’m definitely making this! thanks for sharing! would I be able to use store bought can…cherry pie filling? How different is it from your cherry sauce? When i buy cherries they get eaten before I can bake with them. I have a cherry filling can for a while. Hi, Estera! Honestly, I’ve never tried canned cherry pie filling. I know it’s strange! I’d suggest to open the cherry pie filling and taste it. Also read the label and see if it has to be cooked before serving. Sorry for not being much help here! Hi, nice recipe! Love it! However I think there is and error… Are you sure is 60 gr of gelatin? Hi, Victoria! Good catch! Where did that extra 0 came from?? It’s definitely not 60gr! 🙂 Fix it now. I really appreciate your feedback! Thanks for stopping by! Your welcome! 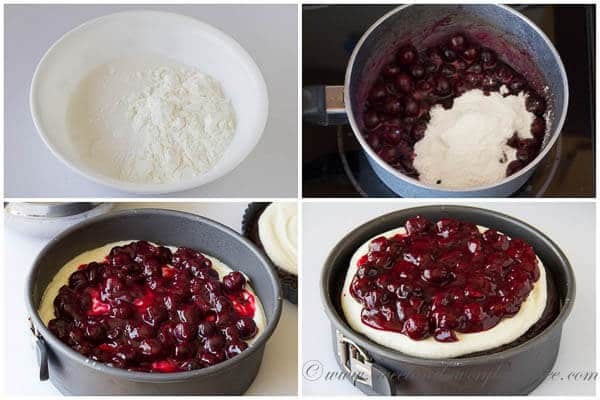 I will try this recipe soon since I have already prepared some kind of cherry jam some weeks ago and it looks like your Cherry Sauce very much, also my husband loves white chocolate so it is the perfect dessert for my family. Thanks. Good luck in all your cooking adventures! You’re welcome. I’m so happy that you made this cake. I’m not surprised that it didn’t last long hehe. It basically disappeared in minutes here as well. I hope to see you aroung, Zdravka! What a tempting pie! 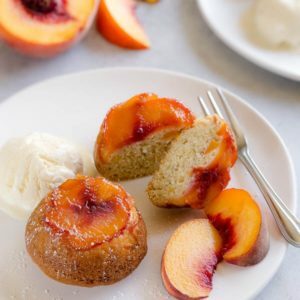 Thanks for sharing the recipe with us! Would you please specify the cup size you use in the recipe? Oh that cherry sauce! Love this Shinee! !